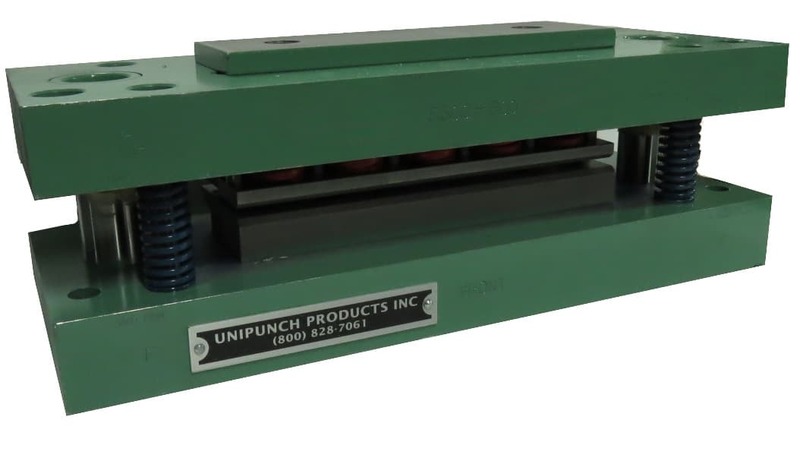 UniPunch 5300 Cutoff Units are a self-contained two post die set with pressure pads front and rear. There are (2) .375” dia. Pilot Pins in line with the cutting edge and (2) hold down locations for quick and accurate positioning onto a template or press bed. This Cutoff Unit has a compatible shut height with UniPunch “B” series hole punching tools. The unit can be mounted in a press or press brake adjacent to existing C-frame tooling or stand-alone cut to length applications in mild steel up to 10 gauge/.134” (3.4 mm) thickness. For larger width shearing units, contact the UniPunch quotations department. Note: Punch & Die steels on Flat Stock Units are not interchangeable. Units must be returned to factory for replacement. Spare Punch & Die steels can be supplied with new units.